Nothing but the best specified for the first of the new-generation Whitehaven Harbour Classic 40, including the full complement of Twin Disc and Seakeeper products onboard for the perfect day on the water. 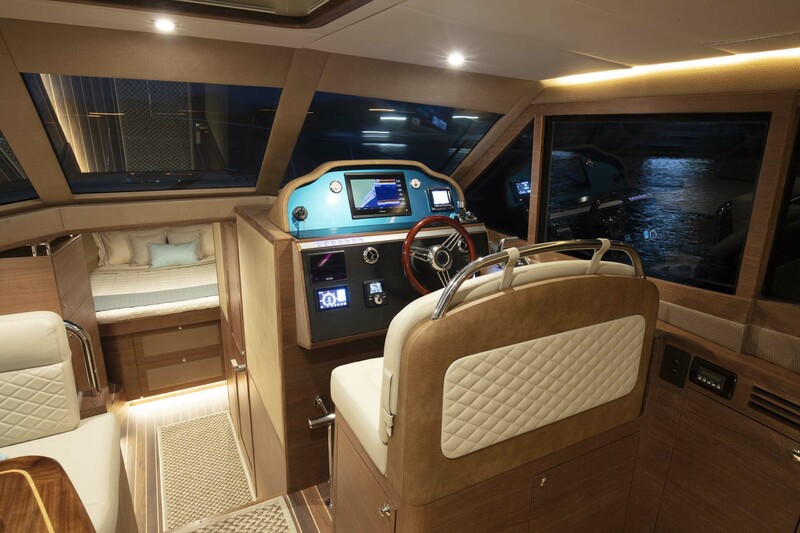 One of the most exciting launches in 2019, the Whitehaven Harbour Classic 40, christened ‘Tonic’, is 40-feet of luxury and comfort. 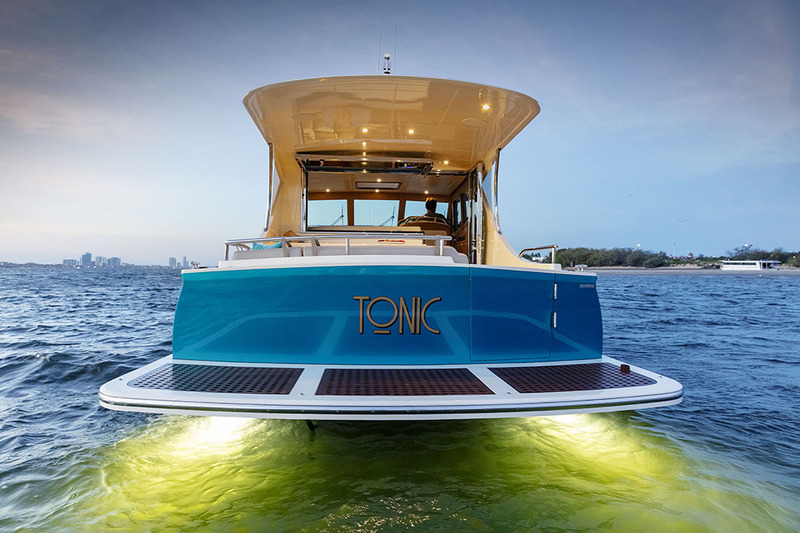 ‘Tonic’ also has the distinction of being the first single engine boat in Australia to be fitted with Twin Disc Express Joystick System (EJS®) and Express Positioning® technologies, as part of the full package of Twin Disc products, complemented by the Seakeeper 3 stabilizer. Following extensive sea trials and her official launch in Sydney in March, ‘Tonic’ will make her public debut as part of the Whitehaven display at the 2019 Sanctuary Cove International Boat Show, 23 to 26 May. Twin Disc Pacific was proud to contribute to this superb cruiser and asked the team at Whitehaven for their views on the Twin Disc and Seakeeper setup. Director and boat builder, Ryan Hanson and naval architect and yacht designer, Misha Merzliakov tell us why they chose Twin Disc and Seakeeper products. What is the main design rationale behind the HC40? The Whitehaven Harbour Classic 40 is a retro inspired picnic boat, ideal for up to three couples to spend a luxurious day on the water, entertaining friends, or extending the experience to overnight or a weekend. In every way, the HC40 is a premium product in all materials, timber, fabrics, styling and finishes. We have brought in some superyacht design elements along with classic European automotive exterior cues. What kind of boating is the HC40 ideal for? The Whitehaven Harbour Classic 40 was designed for a spontaneous, elegant, relaxed style of boating. The hull was designed by highly respected New Zealand marine designer and qualified yacht builder, Bill Upfold. The exterior and interior was designed by yacht designer, Misha Merzliakov. Both Misha and Whitehaven believe they have created something truly special for boaties craving a change of pace by bringing back single-handed boating in a chic 40ft package. The Harbour Classic 40 is ideal for Sydney Harbour, the Broadwater, Whitsundays, Port Phillip Bay, canals, bays, estuaries and lakes. Saying that though, this first model is fitted with a Cummins 550 single engine and can achieve 26 knots. Plus, with Whitehaven’s hallmarks of a reliable, seagoing hull and superior engineering, the Harbour Classic has plenty of power when it matters. What made you install Twin Disc and Seakeeper products on your new boat? On board ‘Tonic’ are the Twin Disc EJS, EPS, EC300 and MGX5065A. In addition, she has the Seakeeper 3 stabilizer for stability underway and at anchor. The main appeal of the Twin Disc system is the control, manoeuvrability and user-friendly set up. Secondly, installing a Gyro on a 40ft luxury picnic boat is essential. Without it the experience can be far from luxurious. To be able to spontaneously set out for an afternoon jaunt on the harbour you want some sort of guarantee that the experience will be what you imagined it to be. We have previously used Twin Disc system in our larger Whitehaven motor yachts, such as the 7500 Sport Yacht, ‘Finito’ and the 6000 Coupe. 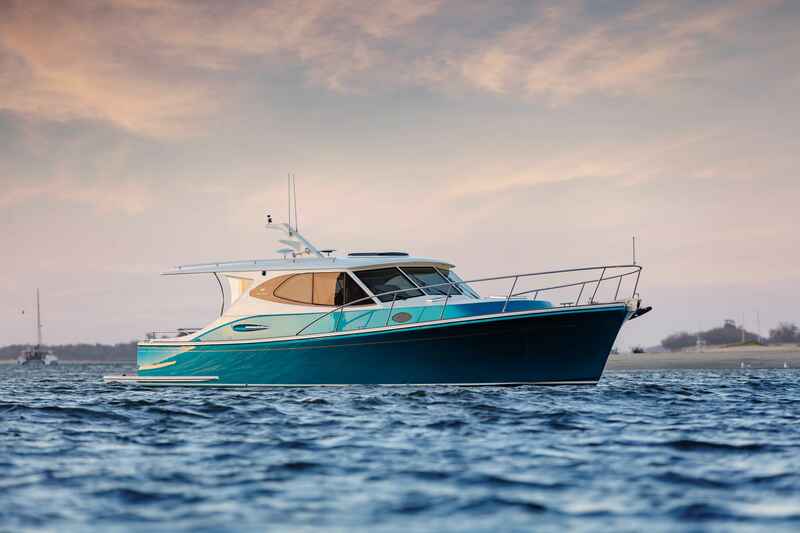 We wanted the same ease of control and manoeuvrability in the Harbour Classic 40, especially since this new model is all about leisure, enjoyment and relaxed living. For that same reason, we sought the stability of the Seakeeper gyro. From a female perspective, how has the Seakeeper 3 enhanced the boating experience? The Seakeeper really makes a difference. Being on the smaller side, as a 40-footer, the HC40 could be susceptible to swell and the wake of other vessels. The Seakeeper removes the roll – you can really notice it, especially when we were moored. The ladies who’ve been on board ‘Tonic’ have all remarked that the Seakeeper delivers impressive stability even in choppy conditions, at the flick of a switch. Most importantly, no more wine spills, and nobody feeling queasy, which adds to the enjoyment of a day out on the water. We don’t spill the champagne anymore when the Seakeeper gyro is on! How does the Twin Disc setup impact on manoeuvrability and control? EJS delivers instant, reliable joystick control, especially useful at slow speeds, while the positioning system is control by GPS and literally locks the boat in place. Both work very well with the single engine. We have two joystick stations, one at the helm and the other in the cockpit. The EJS offers finger-tip control, which gives the skipper confidence in all situations. What is your impression of Twin Disc service? The Twin Disc Pacific team is always willing to go the extra mile, they are perfectionists, like us. Why would you recommend Twin Disc and Seakeeper products?